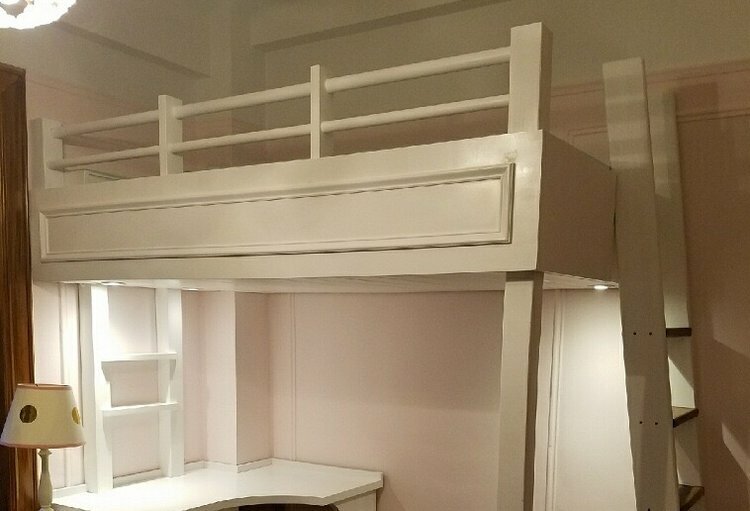 Kids Loft Beds, Bunk Beds, and Lofted Spaces! The little ones love having a cozy space, a kind of fort to sleep in, a treehouse in the City. Mom and Dads love our unique cubby staircases, because they give folks more storage. 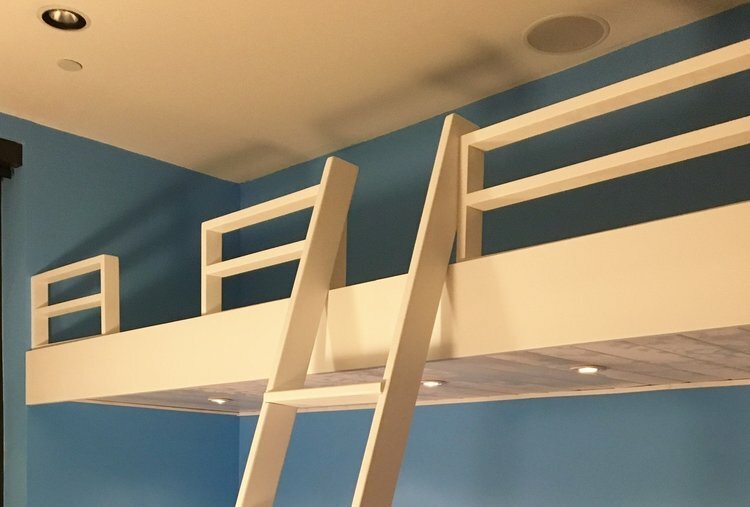 Our loft beds create sweet dreams and are super safe and secure. desk custom designed to allow entry into room (door was down on left, 96” tall). Two armoire/closets create structural elements for loft above, and also give the room more storage! I think this was one of the best projects we ever did - two lofts for two boys, living with their folks at Chelsea Mews, 23rd Street. We have done three projects in that building, thanks to great referrals. This loft had threaded suspension rods, clad in copper pipe - we shined them up using steel wool. Solid walnut steps and railings, painted white loft structure, sheetrock ceiling, and recessed LED lights. The kids loved it! Thanks, Norman Mailer, for modeling for us in this image. Mom and Dad needed a nursery - so we created a room for the baby, by putting the Queen-sized bed over the new nursery! We added a snazzy 20” wide staircase, with drawer storage in every drawer face. We did a pocket door, window, and all the sheetrock on this job. We were in and out within two weeks, well before the baby arrived! White lacquer finish, on custom loft and desk. Recessed LED lights and switch. Solid American Black Walnut on steps of ships ladder. Custom moulding on fascia to match existing on the walls of this classic Pre-War UWS apartment. P.S. You could find something cheaper at a big box retailer, but don’t you want to sleep secure, knowing your kid is in a safe, well-built structure? Let Our Family Meet Yours. Zen Space Makers would love to build your kids a loft! You can call us or email us. You can send sample images, or apartment floor plans, or images of styles and finishes, to sander AT loftbedsnyc.com. Or fill out the nice form. My name is Sander, what’s yours? We care about the users of the loft and would love to meet all of our customers, at the first meeting. Thank you SO much for contacting us about a loft for your kids. We will call you back in about a day or so.